It's been over a decade since the Family and Medical Leave Act of 1993 was passed by Congress. Unfortunately, the confusion that surrounded the law in the beginning has only deepened through the years. Court decisions and opinions by the Department of Labor (DOL) — which issues the operational regulations — have muddied the waters and made human resources personnel unsure about what to do. Some make mistakes that cost their organizations plenty. Others stick their heads in the sand and hope for the best. Still others endure sleepless nights and worry constantly because they know the stakes are extremely high and the opportunities for error practically endless. 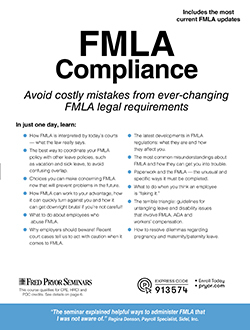 Make no mistake: FMLA does NOT stand for "Friendly Medical Leave Act." In fact, it's anything but. Saroli vs. Automation & Modular Components, Inc. - It is extremely costly to only grudgingly honor an employee's right to leave and to maintain a corporate culture that treads on employees' rights. Smith vs. K&F Industries, Inc. - There ARE circumstances in which organizations with fewer than 15 employees can be liable under FMLA. Spangler vs. Federal Home Loan Bank of Des Moines - Even a conversational, casual reference to a recurring medical condition can constitute a request for FMLA leave. These examples go on and on — and that's why HR personnel and managers can't afford to assume that what they think they know about FMLA is true. Attend this seminar and get the practical, applied facts that will keep your company out of trouble. What has changed with FMLA in the years since it was enacted and how the changes affect employers. The rule on employee eligibility: Does it vary from business to business? How your personnel policies affect an employee’s claim to FMLA benefits. Not as straightforward as it might seem: a look at calculating the 12-month period for FMLA. International workers and FMLA — what’s the rule for their eligibility? 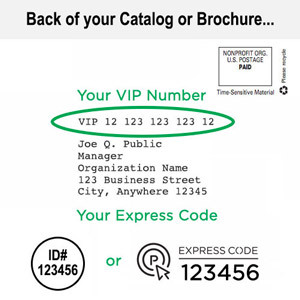 The importance of calculating your number of employees correctly. True or false? Paid leave benefits must be exhausted before FMLA goes into effect. What’s considered a legitimate reason to take FMLA leave? What isn’t? The real meaning of the term child for FMLA purposes (it’s different than you may think). How intermittent leave is handled differently from continuous leave, and the problems it can trigger. The definition of “no fault” attendance policies and how they can affect your company. Make sense of the significant areas of overlap between FMLA, ADA and workers’ compensation. What employers can and cannot do when it comes to enforcing policy. What the law says you must include in your employee handbook regarding FMLA. How to deal with FMLA abuse or fraud without creating company liability. Consequences recently experienced by companies who did not comply with FMLA. If an employee doesn’t ask for FMLA benefits, do you have to provide them? How much responsibility a company has, according to the courts, to keep employees aware of the amount of FMLA leave they have used. An examination of your rights for requesting medical information. What you can do when medical opinions don’t agree. If the employee requests paid leave instead of unpaid leave, does your right to request medical information change? What you must do to avoid liability when you want to terminate an employee who is on FMLA leave. The legal way to handle the employee who may be “faking it” — what you can do if you doubt the validity of an employee’s claim. Intermittent leave records: what will and won’t stand up in a government audit. How to protect your company when an employee on reduced-schedule leave wants or needs to be transferred to another position. Department of Labor hot spots every employer should avoid at all costs. DOL’s plan for a new regulation and how it will affect employers. Who is eligible for the new benefit allowing 26-week caregiver leave? A test for “equivalent status” of a position to which an employee is returning. When you can refuse to reinstate an employee to an equivalent position. A new eligibility rule — an exigency caused by military service — you need to know. What to do when an employee disputes the equivalency of the reinstatement position and how to do it in a way that minimizes ill will. When and how to communicate with employees to minimize corporate liability. Where to locate the latest information on FMLA to stay on top of changes.